Several PC support tools hardware and software tools can help you maintain a computer and diagnose and repair computer problems. The tools you choose depend on the amount of money you can spend and the level of PC support you expect to be building and provide. Essential tools for PC troubleshooting are listed here, and several of them are shown in image below. 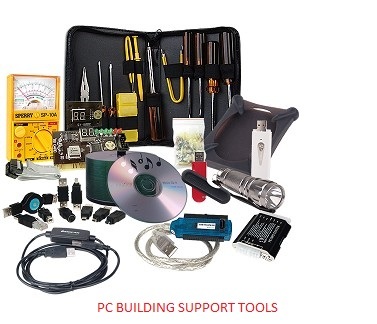 You can purchase some of these tools in a PC toolkit shops, although most PC support tools kits contain items you really can do without. Ground bracelet, ground mat, or ground gloves to use when Working inside the computer case. How to use them is covered later in the chapter. A Cans of compressed air or anti-static vacuum cleaner to clean dust from inside acomputer case. Cleaning solutions and pads such as contact cleaner, monitor wipes, cleaning solutions for CDs, DVDs, and tapes and drives. A Multimeter to check the power supply output. Needle-nose pliers for removing jumpers and for holding objects in place while you screw them in (especially those pesky nuts on cable connectors). Cable ties to tie cables up and out of the way inside a computer case. Flashlight to see inside the PC case. Small cups or bags to help keep screws organized as you work. Antistatic bags (a type of Farady Cage) to store unused parts. Utility software, virus detection software, and diagnostic software on floppy disks or CD. Keep your tools in a toolbox designated for PC troubleshooting. If you put disks and hardware tools in the same box, be sure to keep the disks inside a hard plastic case to protect them from scratches and dents. In addition, make sure the diagnostic and utility software you use is recommended for the hardware and software you are troubleshooting. Now let's turn our attention to the details of several support technician tools, including recovery CDs, loop-back plugs, cleaning pads and solutions, and POST diagnostic cards.